I wrote this for me." -- excerpt from "Try the Selfish"
I've thought and thought about how to describe my response Albert Goldbarth's volume of poetry. The author of over twenty-five books, Goldbarth is certainly prolific and dedicated to his art form. That being said, I kept returning to just one line in the book. Unfortunately for Goldbarth, it wasn't his line. 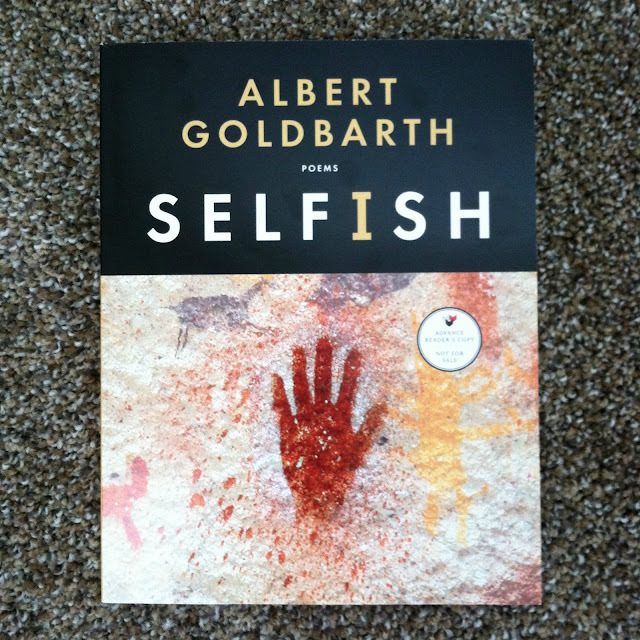 For me, Selfish is a lesson in the epigraph, both its power for good and for ill. In his lengthy volume of poems focused on musings surrounding the nature of selfishness in life, relationships, nature, and art, Goldbarth immediately follows his dedication with a long list of epigraphs (short quotes that suggest the thematic focus of the upcoming work). While all of the excerpts are certainly pertinent to the topic at hand, he begins with one of the most emotionally weighty tributes written by one of the most gifted poets regarding one of the most tragically beautiful love stories of all time. The epigraph is a line Romantic poet John Keats wrote in a love letter to his fiance Fanny Brawne: "My love has made me selfish. I cannot exist without you." As far as I'm concerned, this line is worthy of standing as the sole entry in a poetry book. I've long reflected on the tragic love story of Keats, his faithful fiance, the timeless poetry inspired by their relationship, his short-cut life ended in its prime, and Fanny's life of singleness for the forty-plus years after her beloved's death. A quote like this sets a ridiculously high bar for the emotional gravitas of the material to follow. For me, the volume fell short. That doesn't mean there aren't beautiful lines, turns, and images within the pages--there are--but I'm not a reader who can scan past such a profoundly, emotionally-packed epigraph, dive into the body of the volume, and forget the promised relationship between the two. Divided into five sections--Lineage(s); Everyday Life on Planet Albert; Selfish; Other Lives; and Paintings, Poems, Surveys, Songs, and Other Lyric Flights--Goldbarth reflects upon the many interpretations of selfishness: emotional greediness, naval gazing, excessive concern for the self, and at times our disregard for others. My favorite poems fell within the first and fourth sections. Perhaps not surprisingly, my favorite poem from Lineage(s) is titled "Keats's Phrase" and contains a clever reflection on relationships, dark energy, and desire. In Other Lives, I dog-eared the pages for "World," "As the World Turns," "I Remember the Look of My Ex-Wife Sitting Quietly in the Window on a Certain Day," and the one-line poem "Her One Good Dress" which reads "wedding and funeral." Aside from these, there were not any other poems I particularly enjoyed. Goldbarth's narrative, free-verse style is certainly signature, but not my personal preference. I admire his prolific output, but repeatedly felt I was not the intended audience for this volume.